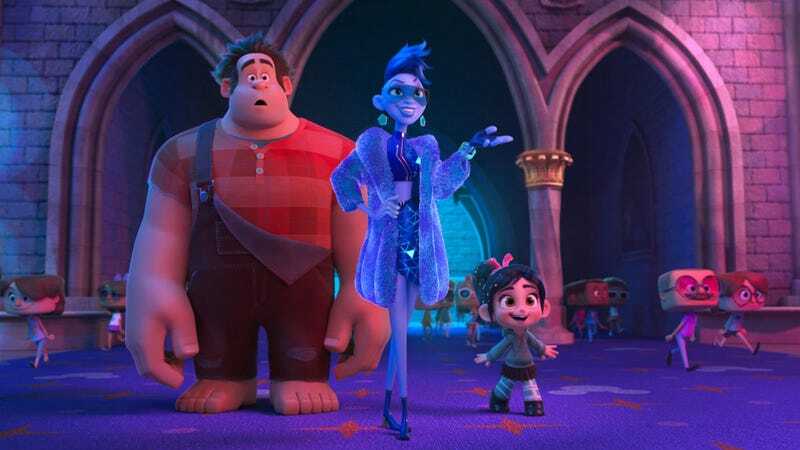 Ralph and Vanellope meet their internet guide, Yesss, in Ralph Breaks the Internet. When your name is “Wreck-It Ralph,” breaking things is usually meant literally. But in Ralph Breaks the Internet, the sequel to Disney’s 2012 hit Wreck-It Ralph, Ralph breaks the internet in a different way: by going viral. Last month, Disney Animation hosted a group of journalists in its offices to introduce us to the world of Ralph Breaks the Internet. We learned about the design of the world and the already legendary princess sequence, as well as the film’s story. The story picks up pretty much where the events of the first film left off, with Ralph and Vanellope von Schweetz happy living inside their respective arcade games. However, when Vanellope’s game, Sugar Rush, breaks, the arcade owner decides to shut it down because no one makes replacement parts anymore. There is one place that has them though, a website called eBay. So Ralph and Vanellope venture into the newest piece of hardware in the arcade—the wifi—and speed off to the internet, where pretty much anything can and will happen. Eventually, the pals get to eBay, which is a literal place in this manic, Disneyfied version of the internet. Inside, millions of live auctions are taking place, including one for the Sugar Rush steering wheel. Not quite sure how eBay works, Ralph and Vanellope just keep saying bigger and bigger numbers, bidding against themselves, until they win the auction for an ungodly sum of money—something they have no concept of and don’t have. So, to make cash, they eventually run into Yesss, voiced by Taraji P. Henson, the brainchild behind BuzzzTube, the place where anything cool on the internet is happening. We don’t see how or why, but Ralph eventually goes viral and makes money off his videos, raising enough money to buy the piece. What happens next? We don’t know. Nor do we know what exactly Ralph’s viral video is. But what we do know is the story team had a very difficult time trying to figure out a believable viral video. “To go viral is not an easy feat,” Josie Trinidad, the head of story on Ralph Breaks the Internet, said. The internet is a huge place. The process began with putting Ralph and Vanellope through a slew of different scenarios and memes and seeing which stuck. The first was a “2 Kinds of People” meme, with Ralph being the goofball and Vanellope being the straight man. It was deemed flimsy. The next idea was that Yesss didn’t just find memes, she made memes, and brought Ralph into her meme factory, a top-secret room at BuzzzTube where people in motion capture suits create animals videos and visual effects are employed to make impossible viral videos possible. Through these different stations, Ralph played a weatherman who gets crushed (“Ice Capped,” the meme said), and made a “6 Foot Blunder,” getting killed in the process. He played Beethoven and got crushed by a big fist, with the phrase “Beethoven’s Fist” over it. Everything was funny but deemed too dark, even for a movie about the internet. The next idea the team had was that Yesss had a meme generator that could take any three words, put them together, and create viral videos. Some examples they tried were “Otter Disco Party” (eventually deemed an “Otter Failure,” after Ralph gets beat up); “Hipster Zombie Karaoke” where Ralph and a zombie did carpool karaoke (it would say “Car Kare-No-Ke” after the zombie’s head fell off); and several others. These were all deemed fun, closer to the right answer, but still not the one. At one point, Vanellope went viral, not Ralph, with some help from some princesses. Then there was the idea to put Ralph into a familiar viral construct, like unboxing videos or makeup tutorials. Everyone at Disney really liked it, but it wasn’t quite right. So it was pushed further: reaction videos, video game walkthroughs, and then finally, in that exploration, they found the one idea that’s in the movie. An idea that was not revealed to us.